Elvis Presley's former piano player released his book Elvis, Strait, to Jesus: An Iconic Producer's Journey with Legends of Rock 'n' Roll, Country, and Gospel Music. 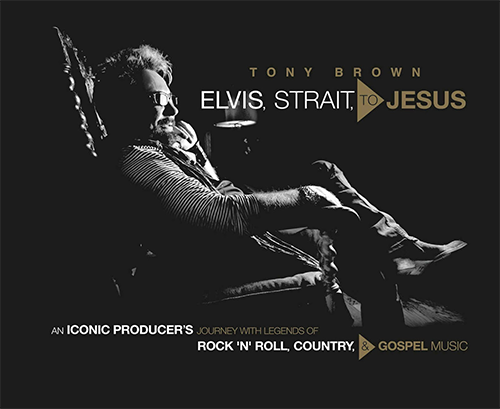 The King of Nashville, Tony Brown, offers a rare photographic journey through his 40-year career--including historical pictures and contemporary portraits of rock, country, and gospel music legends--in which he produced hundreds of #1 country songs that are beloved by millions. From a child pianist banging out hymns in his family's gospel band, to playing keys for Elvis Presley, to producing a string of million-selling hits for artists like George Strait, Reba McEntire, and Trisha Yearwood, Tony Brown's storied career has left a singular impression on American music. Known as the King of Nashville, Tony is adored by the mega-artists whose sounds he was instrumental to crafting, the city he's proud to call home, the millions of fans of of his over 100 number 1 singles, and the aspiring musicians he continues to inspire. The President of MCA Records for nearly two decades and co-founder of Universal South Records, Tony is also referred to as the founder of Americana music, who shook the scene with his edgy signing choices of Steve Earle and Lyle Lovett, before producing a Golden Era of country music from the eighties to the two-thousands, achieving over 100 million in sales. His life, musical legacy, and friendships are celebrated in this keepsake coffee table book, including rare behind-the-scenes images. It also includes contemporary, artful shots of 40 musical greats beloved to Tony, all featured in a French Renaissance chair that has been traveled countrywide for them to pose in, bringing out each of these legends' unique personalities. Included are historical or contemporary photos of artists such as Elvis, Lisa Marie Presley, George Strait, Reba McEntire, Cyndi Lauper, Steve Earle, Lyle Lovett, Trisha Yearwood, Lionel Richie, Jimmy Buffet, and many more.